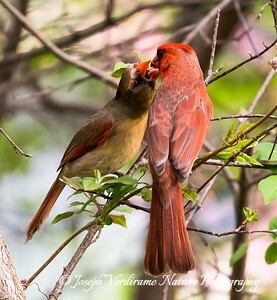 This male Cardinal has just arrived to present his mate with a tasty morsel. 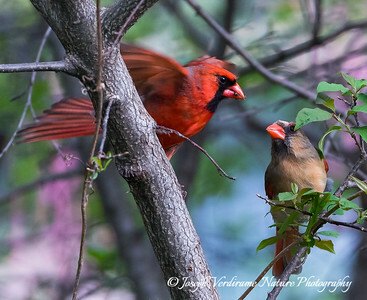 The male Cardinal has just moved closer to his mate to pass her the insect he brought her for dinner. 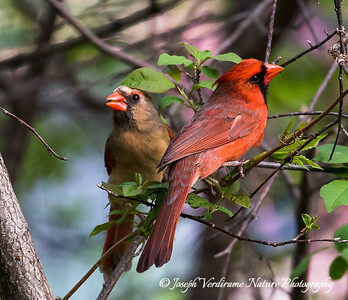 Here the female Cardinal is reaching toward her mate to grasp the insect he presented her with. 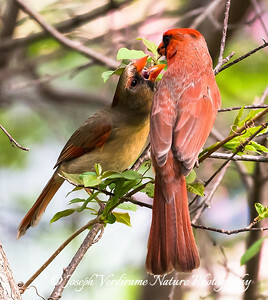 In this final image of the sequence, the female Cardinal is taking into her bill the insect that her mate brought to her. 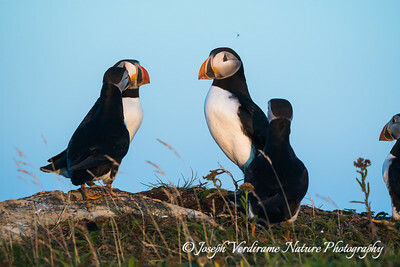 These two mates seem to be posing for a family portrait; in reality the male has just brought the female some food, which she is still holding in her bill. 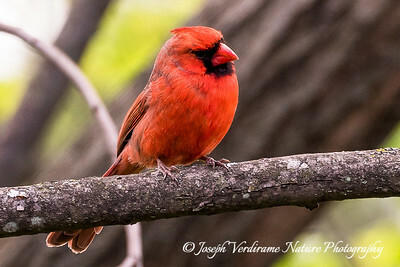 This male Cardinal seems to have cocked his head to one side in curiosity, but more likely just to get a better look at that odd photographer! 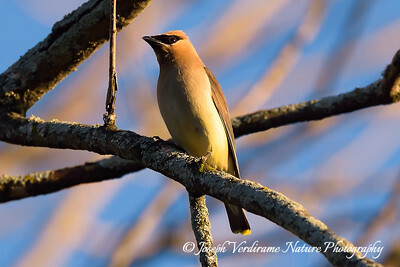 A Cedar Waxwing basks in the afternoon sun of a spring day in Markham, Ontario, Canada. 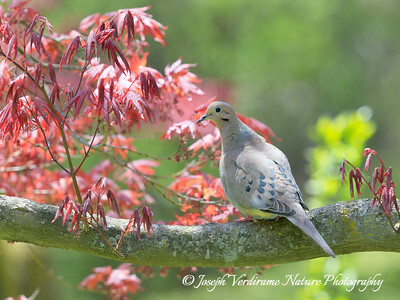 The Mourning Dove, a common sight in our cities and parks, is known for its plaintive and soothing call, which males use to attract the females. 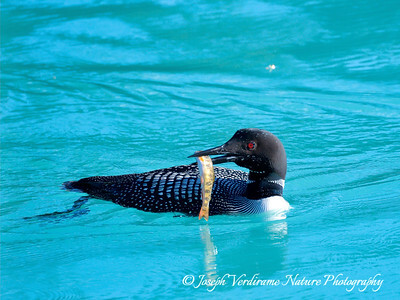 This male loon was proudly displaying his catch for all the world to see in Emerald Lake, Yoho National Park, Canada. 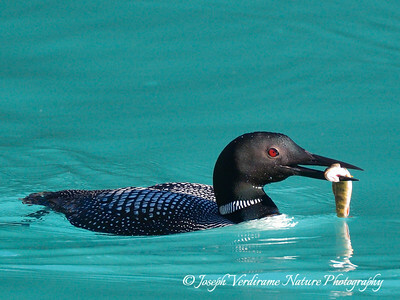 This male loon in Yoho National Park seemed to be showing off his catch and was in no particular hurry to eat it! 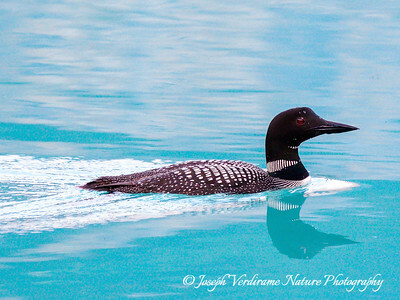 This mated pair of Loons in Yoho National Park were parading the male's catch with some pride, it seemed to me. 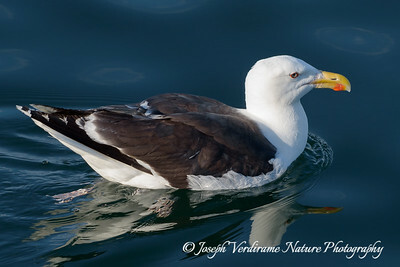 This male Loon has just re-surfaced from a dive. 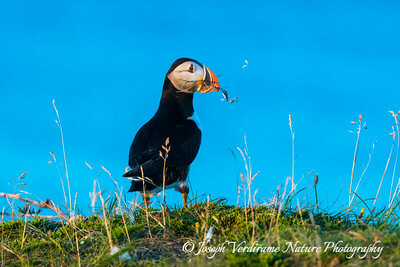 An Atlantic Puffin on a sea cliff high above the ocean in Bona Vista, Newfoundland, apparently enjoying a beautiful sunset. 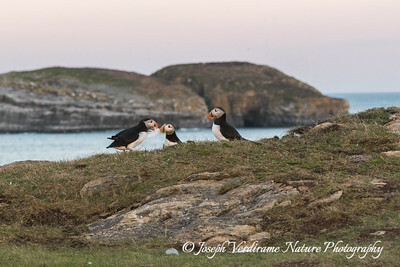 Although puffins seem at home on these sea cliffs, they spend the winter months out on the open Atlantic Ocean and only return to land in the spring! 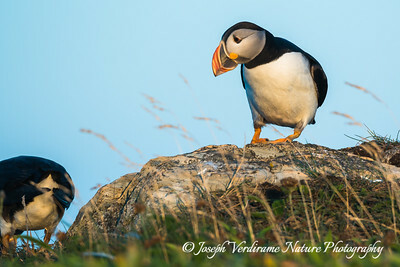 This Bona Vista Newfoundland puffin really seems to be trying hard to get a look at the strange human behind the camera! 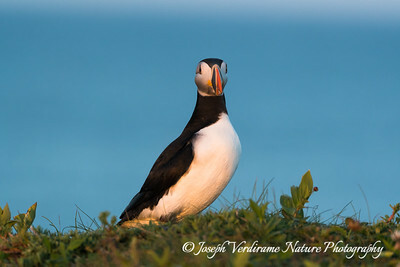 The Atlantic Puffin is a colourful and eccentric-looking bird, reminiscent of an odd cross between a duck and a penguin! 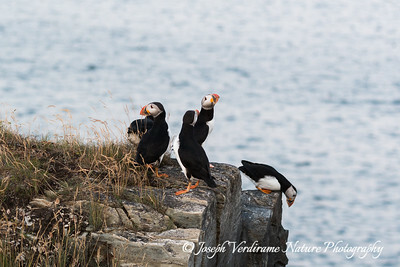 This puffin is striking a pose that accentuates the rather odd appearance of these seabirds. 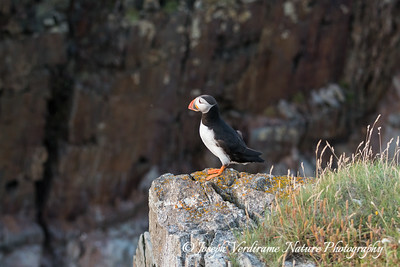 This puffin is going for a little walk along the cliffs overlooking the Atlantic Ocean in Bona Vista, Newfoundland. 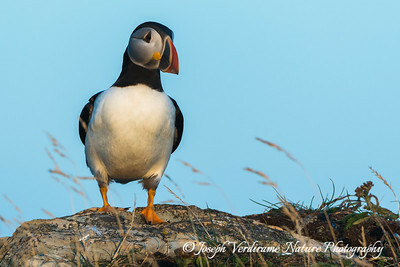 The bill pointed downward and the slight stoop are apparently 'puffin-speak' to say, 'Excuse me, I'm coming through and don't want any trouble'. 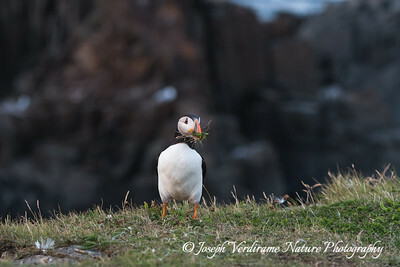 This puffin is busy collecting grasses as nesting material. 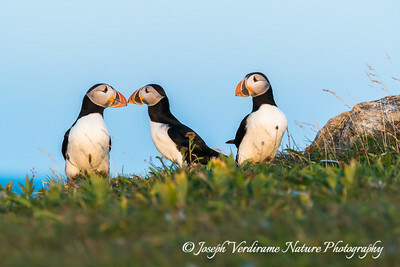 "Billing", or touching bills, is a common courtship behaviour of Atlantic Puffins, which have many endearing behavioural traits. 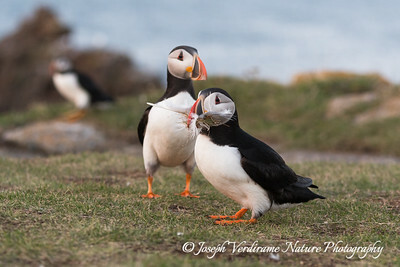 Touching bills is a common behaviour in mated pairs of Atlantic Puffins. 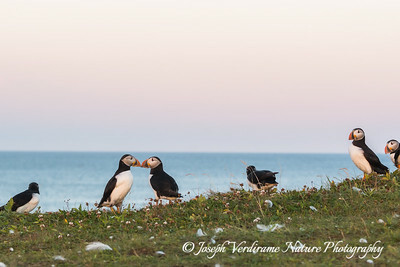 Touching bills is a common behaviour among mated Atlantic Puffins. 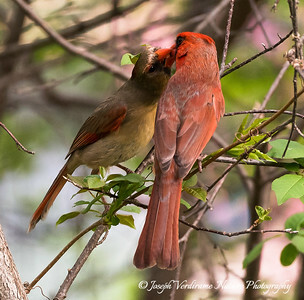 Does it show affection or reinforce bonding? Your guess is as good as mine. 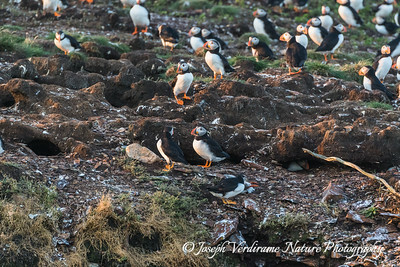 These puffins seems to be holding a formal meeting of some sort! Hmmm, sure seems like a long way down! 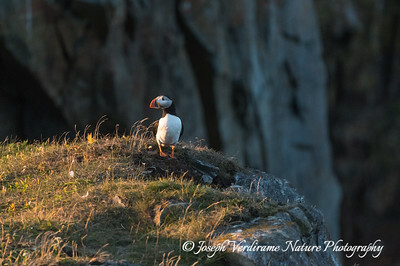 The puffin at the cliff edge on the right seems to be wondering if he should leave the safety of his perch! 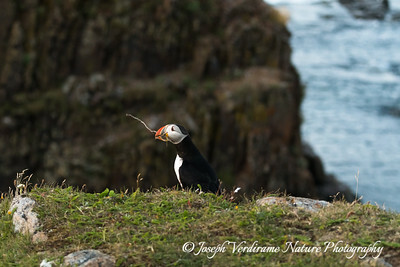 Where did you find that cool stuff? 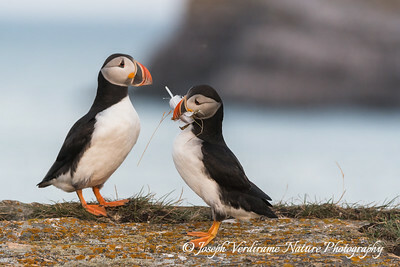 These puffins seem to be very interested in what their friend has collected in his/her bill! 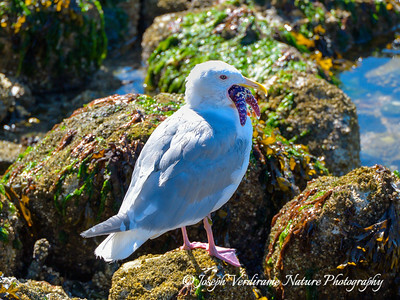 This is what I gathered...what have you been doing? 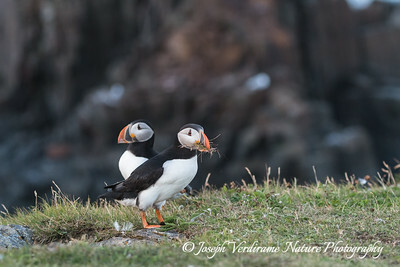 It almost seems as though the puffin with a bill full of nesting material, is wondering what the mate has been doing with his time. 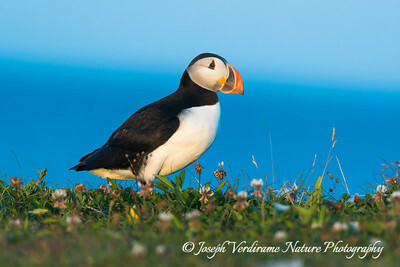 A beautiful puffin against the backdrop of the Atlantic Ocean in Bona Vista, Newfoundland. 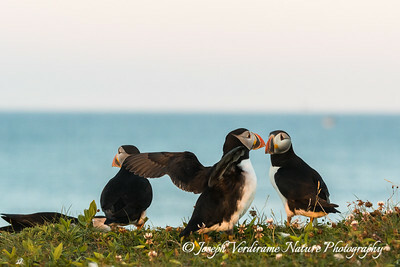 This pose accentuates the rather odd appearance of these engaging seabirds. 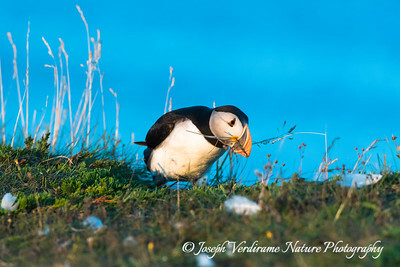 This Puffin seems to be pausing to contemplate life as it gathers grasses. 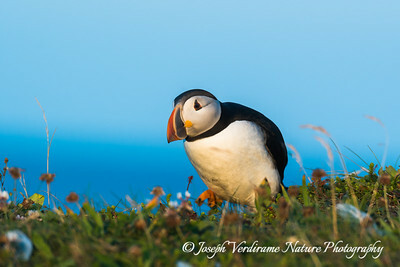 A puffin in its typical habitat high above the Atlantic Ocean in Bona Vista, Newfoundland. 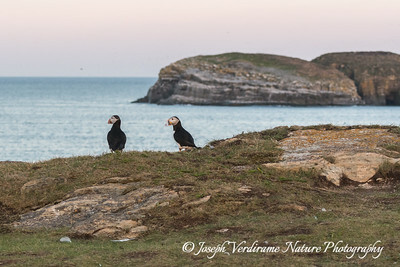 These two puffins seem to be quietly contemplating the magnificent view they get to enjoy every day. 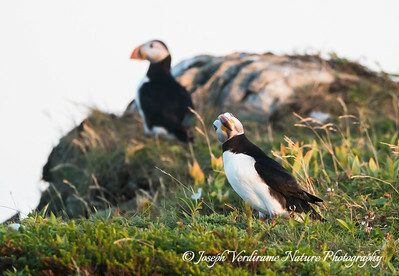 These two puffins seem to be quietly contemplating the beautiful views of the appropriately-named Bona Vista, Newfoundland. 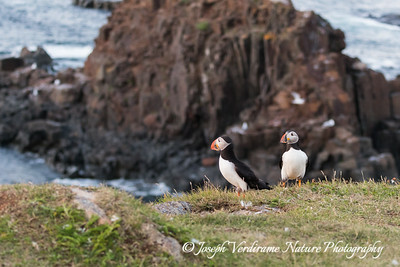 Here the very sociable puffins can be seen in a typical cliff-side colony. 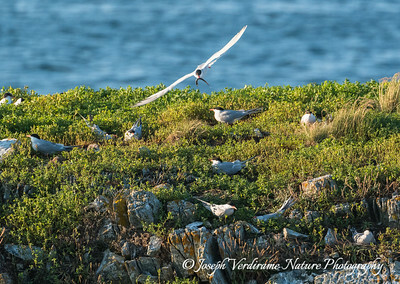 A tern brings home dinner in a colony on the shores of Bona Vista, Newfoundland. 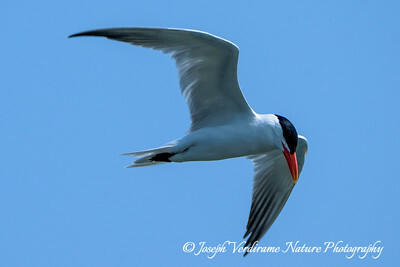 A Caspian Tern scouts the water of Lake Ontario, Canada for fish. 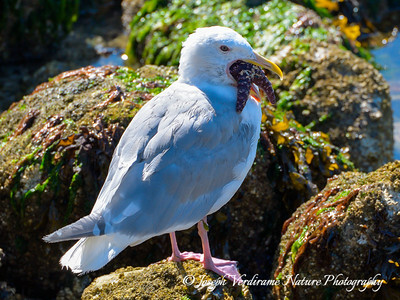 The Black-backed Gull is one of our larger North American gulls and a common sight along the Atlantic Coast, such as this fellow on Cape Cod. 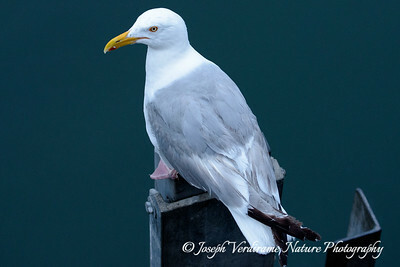 This Herring Gull at a fishing pier in Cape Cod is doing what all gulls do, all day long: looking for free food! 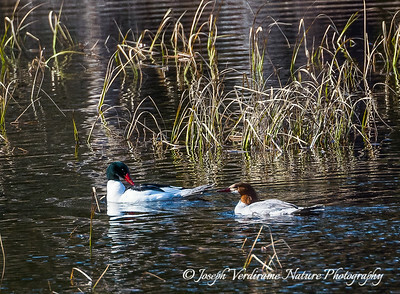 A mated pair of Mergansers enjoy the serenity of a beaver pond in Algonquin Provincial Park (Canada). 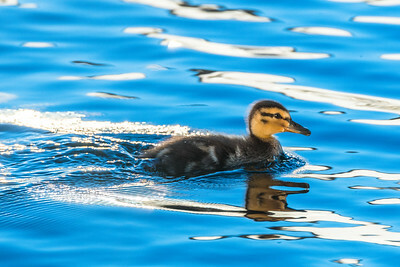 This young Mallard duckling of the year was bravely venturing out on its own into the waters of a harbour in Kingston, Ontario. As common as the Mallard is in many parts of North America, one never tires of the brilliant irridescent feathers, particularly striking in the early morning hours. 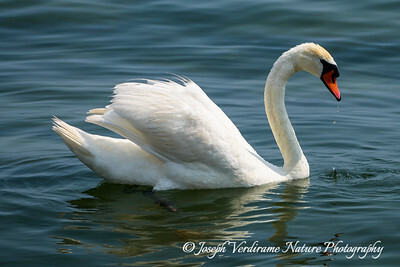 This Mute Swan has just raised its bill from the water after peering down in search of food on a summer afternoon in Lake Ontario.